business using valuable tools that convert more prospects to clients! Note: Webinar with powerpoint slides only, teleseminar is sold separately above. Every year millions of people struggle to make ends meet, finding themselves falling farther and farther behind in paying off their bills. Many others just end up spending much more than they earn, making their debt situation escalate quickly to the point where financial collapse is a strong possibility if something doesn't change. Let's face it, no one wakes up one day and suddenly discovers that they have a serious debt issue. Financial problems accumulate gradually over time until the point where the debt catches up and overtakes a person, leaving them feeling helpless. How to get out of debt and stay out is a challenging question for most people who aren't equipped with the knowledge needed to head in the direction of financial independence. Although getting out of debt isn't easy, it isn't impossible, either. Even the worst of debt problems can be turned around and fixed. No matter how grim a person's financial situation may look, there are some simple strategies that can help a person who really wants to get out of debt make this dream come true. By living out these strategies, coupled with adopting a new and healthy financial perspective, a person may be able to take charge of their debt situation and turn around their life and their fortune. This teleseminar will help your participants break out of their current debt predicament, if they're tired of just paying the minimum amount each month on their debts and not feeling like they're getting where they want to be with their finances. 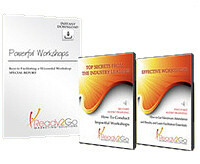 Your participants will thank you for this transformational training. And you do not even have to be a money expert to deliver these strategies and help put your participants on a path toward financial relief. Recognize five truths about debt and shift their perspective on their current debt situation. Implement three steps that will help prepare them for getting out of debt. They can't jump into the challenge of becoming debt free without doing some preparatory work first. Execute two important actions that will aid them in successfully paying off their debt even sooner than they might be thinking. Activity:"A 'Hole' Lot of Debt"
Activity Objective: Participants answer a quick questionnaire meant to assess their debt situation. Activity #1: 'Mini-lecture – The Lowdown on Debt'"
Activity Objective: Participants take notes during a short lecture and then discuss what they have just learned. Activity Objective: Participants explore a metaphor that shows how our behaviors around money can get hard-wired into our brains and therefore difficult to change. Activity #1: "Mini-lecture – Preparing to Get Out of Debt"
Activity Objective: Participants take notes during a short lecture and then teach back what they have just learned. Activity #2: "Where's it All Going?" Activity Objective: Participants do a quick assessment of their expenses to see where their money is going. Activity #1: "Mini-lecture - Paying Off Your Debt"
Activity #2: "Getting into Action"
Activity Objective: Participants list the debt payments the Snowball Method could help them eliminate. Application – New Horizons - Becoming Debt Free! Activity Objective: Participants stimulate their thinking by choosing a different viewpoint from which to see their debt situation.